This past weekend Bryan and I had a class field trip originally set to be in Limestone Canyon. Those plans ended up falling through so professor LaNoue took us instead to nearby Silverado Canyon. 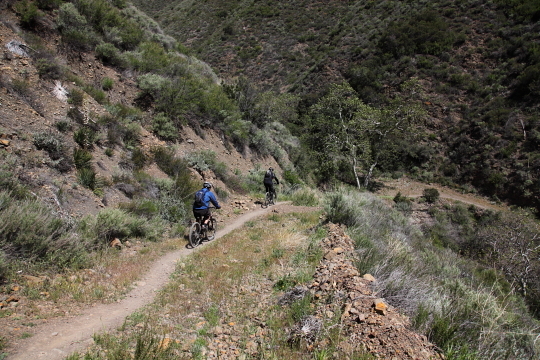 Silverado Canyon is a popular place for hiking and mountain biking. LaNoue originally wanted us to go on a more level trail which Silverado is not. We only walked up for a little while before we decided to turn around. As far as scenery goes Silverado Canyon is bleak, there aren’t many wildflowers but you do get nice views of the canyon when you go up further on the trail. This week’s photo is one that Bryan took as we were going down the trail. A couple mountain bikers road by us on the way down which I have to say is pretty crazy since the trail has a lot of loose rocks. We ended up having a nice time photographing and got some exercise too. Photo Info: Taken with our 5D Mark II at ISO 200, F8 and 1/800 of a second.